Plastic materials continue to play a vital and growing role in packaging applications. It is thus more important than ever that all involved in the packaging industry command a basic understanding of the properties of the common packaging plastics. 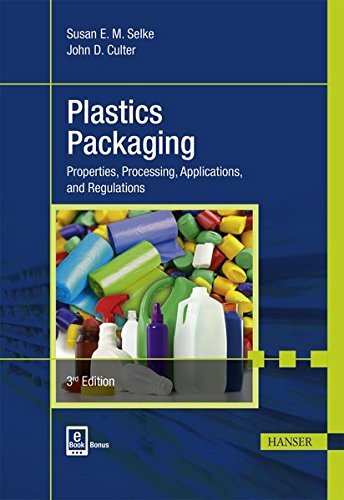 This highly regarded book provides just that to students and packaging professionals alike: material properties and how they relate to the chemical structure of the polymers, common processing methods for packaging applications, help with writing specifications, designing, fabricating, testing, and controlling the quality of the plastic material are covered comprehensively. The third edition introduces expanded discussion of PLA and other biobased plastics. The coverage of tensile properties is also enlarged. Further updates and enhancements throughout ensure Plastics Packaging remains an indispensable resource for both the packaging expert and the novice. This new book is intended to provide a basic understanding of plastic packaging materials. It contains a broad-based discussion, beginning with the definition and common properties as a group, and continues with a detailed description of the significant properties of the major packaging plastics and of specialty polymers with significant applications in packaging. The authors stress the relationship between chemical structure and packaging material properties. This book is an example reference tool for packaging professionals responsible for writing specifications, designing, fabricating, testing, and controlling the quality of plastics materials, and for students studying packaging. Study questions for students are included at the end of each chapter. Susan E.M. Selke, Ph.D., is Director and Professor at the Michigan State University School of Packaging, where she has conducted research for over 30 years. She is author of 12 books focusing on packaging technology, as well as numerous book chapters, peer-reviewed articles, and reviews. John D. Culter, Ph.D., is President of Advanced Materials Engineering, Inc., and has worked in the plastics packaging industry since the early 1970s. He has developed and taught several courses in polymer packaging at Michigan State University and the Missouri University of Science and Technology, as well as in Brazil and Argentina, and online. Selke, Susan E.M.; Culter, John D.